Explore the community through the general activity feed before heading to searching watersheds, organizations, hashtags, or individuals. 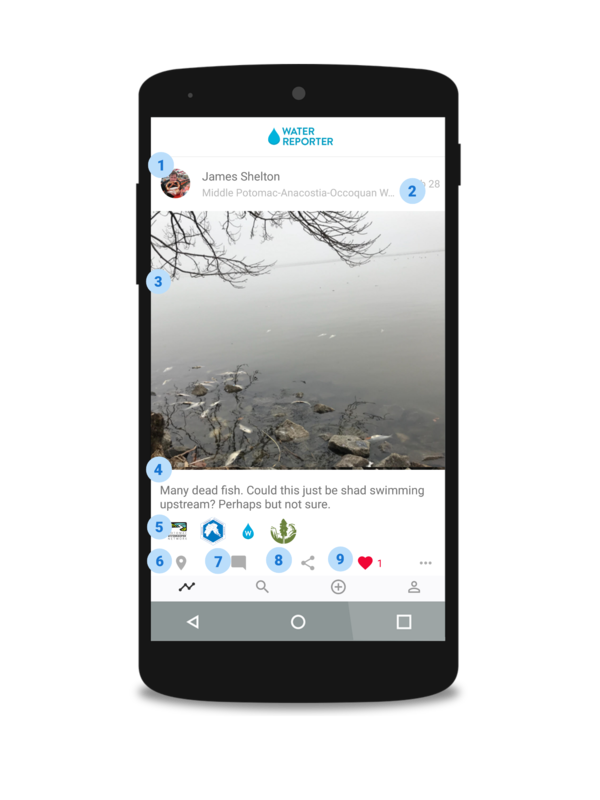 Water Reporter’s Activity Feed is a great way to stay on top of all the latest reports being shared by our active user base. It serves as a convenient launch pad for commenting on a report of interest, sharing a report to social media, and even getting turn by turn directions to the location. Our aim is to make it as easy as possible to stay up to date on the latest community activity while being exposed to observations and reports from a diverse array of watersheds. Below are a few ways you can interact with reports shared by our community members. Each report consists of simple routes to additional content or actions. Starting with the top of the report and working our way down, users will see the community member who posted, their profile picture (if applicable), date of the report, and the watershed it was shared from. Tap on the user’s profile picture to learn more about them, view a list of their observations, any actions taken, as well as view the groups they belong to. Under the report photo you can find a helpful toolbar, report description (if provided) as well as hashtags for categorizing the report (if provided). Poster's name - click to visit his or her profile page and personal report feed. Watershed - click to discover the HUC8 watershed of the report and explore other nearby activity. Photo - every photo shared in a report is geo-located, nesting it within all HUC watersheds associated with that location. Comments - The original poster can provide information about the post in the comments field, including hashtags to associate it with ongoing campaigns - or start a new one! Pinpoint - Find the report on a map. Comment - Contribute to the conversation or see what others are saying about this report in the comments section. Additional photos can be added here as well. Share - Posts can be shared beyond the Water Reporter community via Facebook, Twitter, Email and text message, to name a few. Like - Don't have anything to say but want to show your support, "like" a report and keep scrolling.